August Update | Hampton Industrial Services, Inc. It has been an extremely busy summer at Hampton Industrial Services, Inc.
Our road crews have been moving corrugated box machinery in Ohio, Michigan, Illinois, Kentucky, Pennsylvania, and Wisconsin just to name a few places. We helped a long-time customer, US Corrugated, set up a new facility in the Atlanta, Georgia area that kept crews busy for an entire month. Right now, they are helping relocate an entire facility in Ohio. Our Indiana location just finished refurbishing a 50″ x 110″ S&S 2-Color Flexo Folder Gluer. This machine was updated with all new electrical, touch screen displays on every section, new blade systems, recovered Anilox rolls, newer glue systems, new folding rails and belt guides and much more. After testing the processes, our road crews came home long enough to prep the machine for delivery to it’s new home in Joplin, Missouri. Crew members accompanied the machine to orient and train operators on the refurbished machine’s systems. Check out the pictures of the finished project. 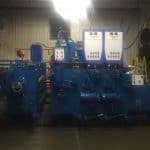 As that machine was being loaded out of our Indiana facility, another machine was being moved over from our warehouse to start the refurbishing process. Crews are busy on this new project while another machine is being shipped to the warehouse to await its makeover. As fall approaches, there is no sign of slowing the pace. We are excited about our relocation to a much larger facility that will give us a bit more elbow room. The building is being planned and prepared for operations to start hopefully by the end of the year. We hope to have pictures posted soon, so check back in!